After suffering gunshot wounds from an unknown assailant in 2004, an Australian man found some disturbing Google results when searching his own name. Image, text, and even Google autocomplete had linked him with local mobsters, perhaps leading to his attack. Though this is an extreme case, it reveals just how far and just how damaging negative search results can be, whether true or untrue. Today, Google handles over 3.5 billion searches every day, a notable portion of which are people looking up their own names. By 2025, the world will create 163 zettabytes of data. To put that in perspective, that’s nearly 55 gigabytes worth of new data per person every single day. This seems like a lot, but we’re already not so far off from this massive data prediction. Americans are sharing more and more information about themselves than ever thanks to encouragement from social media sites, the convenience of online data storage accounts, and our bad habits of personal oversharing. More than half of Millennials have Googled themselves at some point and among Gen Zers, those born from 1996-present, more than one in ten do so every single day. Looking back to our wounded Australian friend, the results that he found pertaining to his own name, though false, nearly got him killed. On a smaller scale, incorrect information could cost us our dream job or first choice university. Far from a comprehensive database of fact, what many people find on Google after searching their own names comes up to be either untrue or influenced by other people of the same name. In fact, only one in five people who search for themselves find accurate information. Thought these accounts are often protected behind usernames and unique passwords, criminals online know exactly which buttons to push to find the information they are looking for. Because of our lives being so intertwined with online access, cyber criminals are able to gather bits and pieces of information; a little bit from Facebook, security question answers, and our usernames. From there, scammers can build a comprehensive and personal guide to not only our private data, but our personality, insecurities, and fears as well. 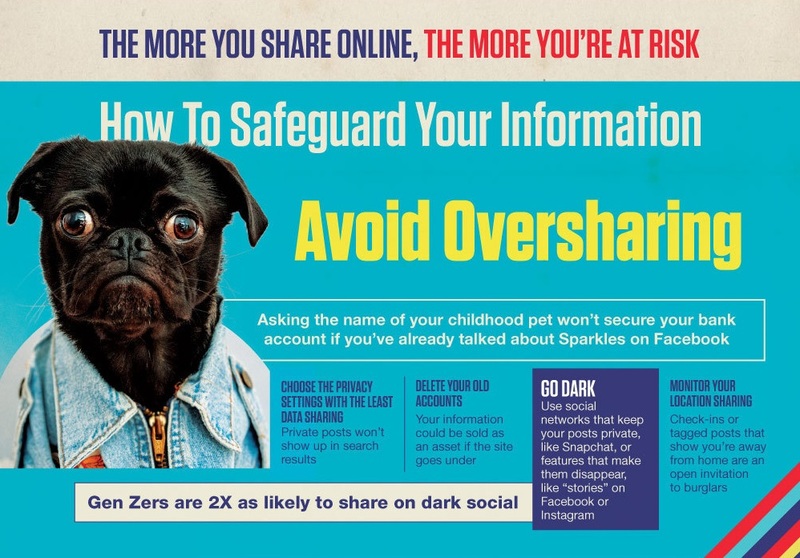 The more we share online, the more we put ourselves at risk. Managing our data online is a tricky game and once it gets out of hand, it’s difficult to control. Detailed in this infographic are the steps we can take to keep our information secure and how to avoid targeted phishing and email scams.